Do you want a great looking website?! Maybe refresh your old or you need a logo? Almost everyone has Internet to see what happens in the cyber world. You only see the latest on Facebook, and far from everyone is there. A real website is still the strongest way to reach out with your message in the best way. A website is still the best marketing! A website with a neat and stylish design, great layout and nice pictures are valuable. I design that website for you, so you get a personalized home page that nobody else has! I build the website from scratch with honest HTML script, which fits in all browsers, or in WordPress if you prefer. Send an e-mail and tell me your wishes, colour and style you like, and what the website should contain. Have you been inspired by a page on the Internet, please send the link so I can see what design you like. 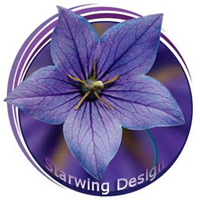 Or take a look under PORTFOLIO - websites created by Starwing Design! You must have a web host where all the files that make your website can be posted. Otherwise they can not be seen publicly. A web host is as it sounds - a hotel with different rooms for websites where you put all the files to your website. If you want, I can help you book your hosting company and recommend One.com who has incredibly low prices for webhosting and domain name. Having your own domain name is preferable. You even get your own email address through your domain name eg: name@yoursite.com Not only is it neat and professional with your own name - you also avoids advertising! I also do ads, banners, brochures, collages, invitations, Christmas cards, logotypes, etc.